Kim Kardashian West & Kanye West Ready for Baby No. 4? Kim Kardashian and Kanye West aren't ready for a fourth child as of now, but will they be in the near future? After reports surfaced this week stating that the Keeping Up With the Kardashians star and the "Stronger" rapper are currently planning for another baby, Kim told E! News, "None of that was true." "But I've been really open about it and talked about it on our show, so...I don't know," she shared with us. "We start filming season 16 next week, so if I think about it more and it's gonna happen, you'll definitely see it on the show. But as of now, no." Kim and Kanye share kids North West, 5, Saint West, 2, and Chicago West, who they welcomed via a surrogate in January. 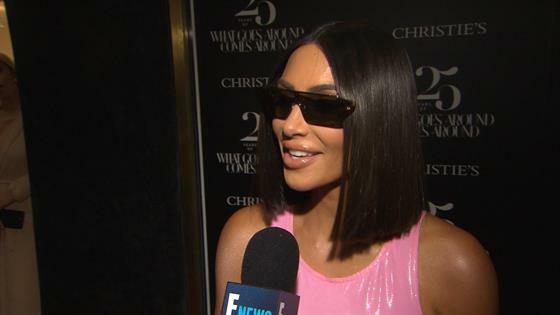 Fans of KUWTK will know that Kim has been very open about her journey to have another child following her difficult pregnancies with her eldest children. During a Nov. 2016 episode of the show, Kim explored the idea of surrogacy after meeting with two doctors who told her it "wouldn't be safe" for her to get pregnant again. In June 2017, multiple sources told E! News that Kim and Kanye had hired a surrogate to carry their third child. A few months later, Kim confirmed that she and Kanye were expecting a baby during a phone call with Khloe Kardashian on KUWTK. Now E! News has learned more details about the couple's future plans for a fourth child. "Kanye has always wanted a big family and he has gotten Kim on board. They would love a fourth," a source tells E! News. "They both feel like if it's meant to be then it's meant to be and they want to take that chance and see." Another insider tells E! News that Kim and Kanye have had another embryo stored and have "always considered" having a fourth child. "At this point in time, it has been a conversation between them, but they haven't acted upon it yet," the second source shares with us. "Both Kim and Kanye always agreed on both wanting several kids and a big family. They love having their kids run around and be able to grow up and enjoy each other as siblings. They definitely would want the fourth child to be close in age with the others. Family is very important to them." "Kim and Kanye haven't made any decisions regarding the fourth child," the insider continues. "They would both be over the moon excited to have another child, but right now they are enjoying the newest addition Chicago as well as their other children." A third source also confirms to E! News that the couple would like a fourth child.